Long blooming. Spring to mid-summer. Well-drained, preferably sandy soil. Drought tolerant. Easy. 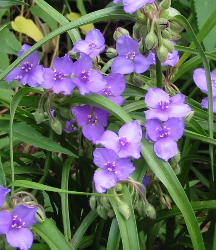 Shorter and more drought tolerant than Ohio Spiderwort. Clump forming and self-sows. Plants can be sheared after flowering for refreshed foliage.